EMR (Electronic Medical Record) software is an essential tool for managing patient records, whether it's for examining charts, sending prescriptions directly to a pharmacy, connecting to labs for test results, or providing a portal for patients to see their results. A key concern is to ensure that the software does exactly what it's supposed to do, and more than that, integrates with other software applications as required. 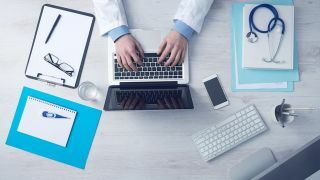 This is especially because these days a lot of EMR software overlaps with the functions of EHR (Electronic Health Record), not least because it can simplify compliance and regulatory requirements. In fact, you'll also find that a lot of EMR providers now include EMR as part of a wider EHR solution simply because it allows them to provide a more comprehensive and inclusive service. Therefore don't be surprised if you find your chosen EMR provider may also supply EMR as part of an EHR package, and also provide practice management as part of a suite of services. Either way, whichever EMR solution you're looking for, we can help by featuring the best in EMR providers out there. Centrity EMR from General Electric is an EMR software platform that aims to deliver across ambulatory care, population health, patient engagement, as well as analytics, in a package that can integrate with other practice software solutions. Centicity EMR can offer customized workflows as well as share data across the healthcare ecosystem, not least with other providers and financial institutions, via HIPAA compliant data transfers. The software takes a modular approach and is simple to navigate. Staff shouldn't have a problem being able to drill down through patient records to find specific information, such as charts, appointments, and medical history. There's also a patient portal that allows them to make appointments, find test results, and access billing options for payment. There's also a mobile app for users to gain easy access to information on patients, and GE also provides a PM (Practice Management) platform that Centricity EMR can integrate with. Altogether, Centricity EMR is a fairly comprehensive and standard software package, with no real flaws and plenty built into it that should satisfy at least small to medium practices. There's also an enterprise version available with further customizations available. Ultra Charts from American Medical Software is an EMR solution that manages patient records, appointments, prescriptions, billing, and a patient portal. It's fully integrated and certified, and is available either via the cloud or downloadable on-premises software. Where AMS Ultra Charts really comes into its own is two areas: ease of use, and support. It does exactly what it needs to, with EMR records seamlessly integrated into a billing and management system that works easily with insurance companies. There are also customized templates available to work across the health sector. While inevitably there is some learning curve in using new software, AMS are known for having a strong support ethic and will usually go out of their way to walk users through the system. Overall, AMS Ultra Charts is focused on just being easy to use while getting the job done, and if any problems come up in doing so it's usually easy to get the support you need. Epic EMR is a robust piece of software aimed at hospitals where different specialist teams will need to have easy access to patient records. There are various screens and workflows for patient care, which extend into specialty and ancillary care. There are also billing and health insurance management options, and Epic EMR also comes with the ability to work across multiple health providers, especially community health settings. It's a very comprehensive solution that works with a lot of data, which is both a pro and a con. By trying to do so much, users can run into problems if the platform hasn't been properly configured and customized. This is especially the case where workflows needs to be shared between teams. It can also store so many data points that sometimes it can be difficult to find exactly what what is needed. All in all, Epic EMR is a solid piece of software that does what it needs to in various specialist ways, offering a wide range of options, while running from the cloud with mobile-friendly interfaces. The key to getting the most out of the software is ensuring that workflows and templates are optimized for the practice it needs to run in, which may require something of a learning curve. Once completed, working with it should be easy, painless, and rewarding. inSync EMR is a cloud-based platform that aims to cover all the usual bases you'd expect with EMR software, while also providing support for general practice and billing management, as well as a patient portal. Where inSync come into their own is their approach to working toward multiple health sectors, providing templates and workflow intended to be optimized for them. Even still, there are customization and configuration options available to ensure it's working to its full potential. This flexibility comes at a price, however, in that implementation may require something of a steep learning curve. Support from inSync has two tiers, which doesn't help matters, with the first being connected to sales and development to ensure initial deployment, but then overseas call centers for continued customer support which may not be so easy to work with. However, once everything has been set up and customized as required, the system should be smooth, reliable, and easy to work with. Overall, a solid and heavy-duty approach that aims to appeal to the widest range of health sectors, while delivering on both core and customized options to work with each of them. The main hurdle may be deployment and support training, but if you can properly plan for that before going live the experience should be relatively painless. The WebPT EMR software offers a general cloud platform that's easy to use and can be used on the go and not just from the office. It's HIPAA compliant for security and aims to make medicare compliance as simple as possible, not least through the use of an 8-minute rule that allows billing and forms to be amended. Unlike other EMR's, WebPT's offering is "designed by therapists for therapists" so it has a more focused set of templates and workflows to work specifically within this specialty. That means intuitive SOAP notes, referral tracking, and custom evaluation profiles, as well as outcome measurement tools and scoring for evidence-based tests. On top of reports and analytics, WebPT EMR also includes appointment reminders and document scanning, which are nice little time-savers. As may be expected with a cloud platform, this software is easy to use and navigate and accessibility is good. It's not difficult to use and has far less of a learning curve than most other platforms, making it easy to train-up other staff members to use it.